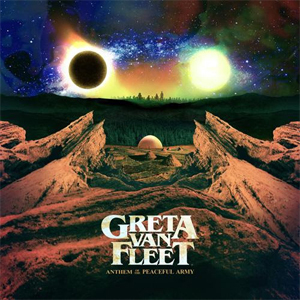 GRETA VAN FLEET - Jake Kiszka/guitars, Sam Kiszka/bass & keys, Josh Kiszka/vocals, and Danny Wagner/drums - is very proud to announce the upcoming release of the band's debut album, Anthem of The Peaceful Army, due out October 19 on Lava/Republic Records. The album is available for pre-order now by going HERE. Fans who pre-order the album will receive an instant grat track, the brand new song "Watching Over", that you can check out here below. Collectively written by all four band members, the ten original songs explore a variety of topics that include fresh starts, love, integrity, innocence, adventure, diversity and peace, the life cycle and its inherent responsibilities, courage, masked deceptions, revolution, and truth. Blending rock, soul and blues, Jake's blazing guitar riffs, Josh's soaring, powerful vocals, Danny's thunderous drums, and Sam's swaggering baselines and keys create a menagerie of musical elements throughout. The first single from Anthem of the Peaceful Army, "When The Curtain Falls", arrived at rock radio on August 15 and is already a Top 10 track with more than 13-million total audio streams. The song's companion music video has surpassed 1.7-million views and can be seen on KNAC.COM HERE. Music fans were first introduced to GRETA VAN FLEET in March 2017 with the release of the band's debut single "Highway Tune" that held the #1 position on U.S. Rock Radio Charts for five consecutive weeks and on Canada's Active Rock Radio Charts for nine straight weeks. For GRETA VAN FLEET, 2017 went on to be a wild ride of sold-out concerts in North America and Europe, glowing press, accolades from a slew of fellow artists from Elton John to Nikki Sixx to Justin Bieber, millions of YouTube video plays and Spotify streams, two #1 EPs, and most importantly, the genesis of an extraordinary connection with their fans.